As I said I opted to visit Hyderabad to Warangal by road in my Honda Brio only to enjoy the long driving experience with my family. Before proceeding further I just want to share few general information for those who want to plan a weekend trip to Warangal and looking for options to visit there. If you don't have a car then you can hire a Car or else take train to reach Warangal. It is very near to Hyderabad and one of the prominent cities in Telengana state after Hyderabad. You can board into any train from Secunderabad railway station in the Morning and reach there max within 2 hours. Generally it will cost you 100-150 Rs per head. If you want to board a Car then I think it will cost you around 350 km x 10/km = 3500 + 500 (driver bhata) for a round-up trip. Although I am not sure but approximately it will be nearby amount only for an Indica AC car. You can also take bus to travel Warangal and that may cost you 150 - 300 max as per your choice of bus type. Now let's disclose my travel data here. 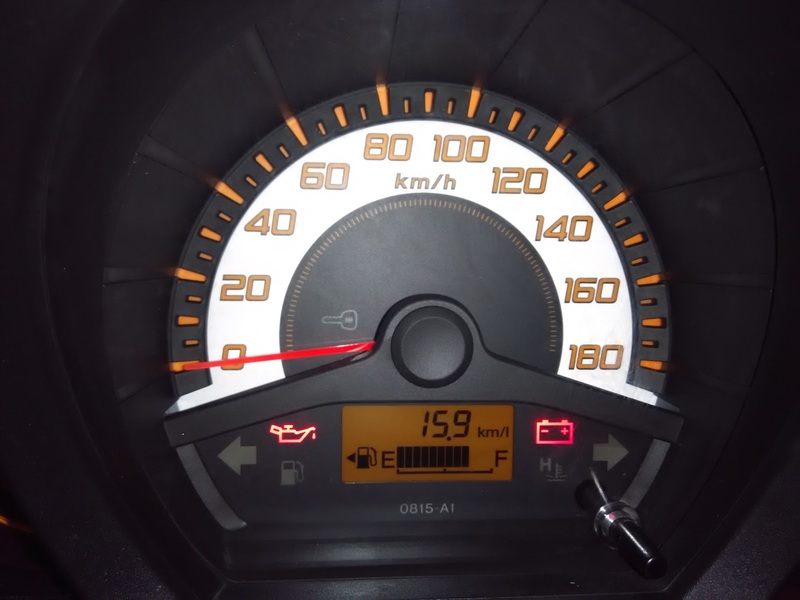 I have traveled total 312 km and mileage as per my meter is 15.9 km/lt. Which means approximately 1600 spent on fuel charges or you can say travel cost. The journey was very comfortable for my family. This fuel economy is including driving in highway, city and with AC on condition. So I think here my BRIO scores 10/10. Not only that, while returning back to Hyderabad I was able to utilize BRIO's 1.2 lt engine power at max by putting the AC on and overtaking many lorries at a speed of 80-90 km/hr. But it was too risky to drive during night on such roads. There is only one way to reach Warangal from Hyderabad if you opted to travel by Car, which is NH163. We have started from Alwal area, after crossing city traffic we took the shamirpet-kesasara road and finally touch the highway near to Sri Chaitanya Jr. College. If you are starting from Hi-tech city area then I think better to follow the Secunderabad-Ghatkesar road and the touch the highway. On your way you will come across few known places like Bhuwangiri, Aler, Yadagirigutta, Pembarti, Jangaon, Yashwanthpoor, Raghunathapally, Chagal, Kazipet etc. Now Kazipet is a point from where we took straight towards Hanamkunda. If you want to reach Warangal first then you have to take the right. From Hanamkunda also you can take right and after visiting Thousand pillar temple and Bhadrakali temple take straight to Warangal. Unfortunately we were late as we have started late. And it was around 5 PM when we have finished these 2 places. Then we have decided to come back by night only and for that we had to start by 6-6:30 PM max. The road from Warangal-Hyderabad is not that safe during night so it is better to avoid driving at night. Majority of the road is a 2 lane road without any divider and street light. So driving in that condition is little risky and I felt that day while driving back to Hyderabad. In fact my friend told me that few areas were naxal affected which we crossed by 7:30 PM. Anyway he told these things to me only after reached Hyderabad :P On our way back we had dinner at Vivera Hotel. You can find many such places but its better to choose places near to Hyderabad, so that you can enjoy the dinner & at the same time avoid driving on highway at late night. Within city driving is definitely safer. It was my first day long drive and frankly speaking I was completely exhausted by the end of the day. But I really enjoyed the driving. Like always I was high on excitement on the beginning of the journey and also fit enough to drive without any break. But on evening while returning I was feeling monotonous and hoping to finish this journey soon. Actually I was little worried about my kid and family as well as I was driving at night on a highway. Anyway I took few breaks to keep myself up and able to make home keeping everyone happy. That was the ultimate moment of that journey. And I know with all these learning’s I will plan a lot such trips in coming days to enjoy driving on my Brio with my family. I hope you like my experience of drive from Hyderabad to Warangal and I am able to share all my learning here. I will be really thankful if you want to share more on this topic or driving experiences by simply commenting in this article. I am preparing few more articles from my experience and learning’s on this Hyderabad-Warangal journey.